You know how I mentioned that we went to Powells a bit ago? Well, I had a little fun browsing around and one of the books that I picked up was Masterpiece , by Elise Broach. The premise looked like it had some promise to it - a family of beetles inhabits the wall behind the kitchen sink of the Pompadays' New York City apartment. Eleven-year-old James Pompaday is kind of a lonely kid who feels out of place living with his (rather neurotic) mom and step-father. James' artist father is rather ridiculously out of touch with his son, giving him a pen-and-ink set for his birthday. James doesn't really know what to do with the set, so he lays it on his desk with a sigh. Through this confusion, Marvin the Beetle and James the boy discover one another and become friends on this art history mystery book. What makes the story even more intriguing is that Broach took a twenty year break between writing the first few chapters and then completing the book and seeing it through to publication! My one and only caution in a recommendation is in saying that the book does deal with the theme of divorce. Normally I wouldn't really go for a book where divorce is such a heavy theme. I'm not out to pretend that it doesn't exist, but I do think that society treats the idea of divorce as if it's no big deal. "Everybody does it." But that doesn't remove the pain of it. Divorce IS a big deal and, quite frankly, too prevalent in today's day and age. If I felt that this book was condoning our present day approach to divorce, I wouldn't feel very enthusiastic at all about recommending it. But, after the initial description of James' family make-up, that subject matter faded away and Marvin emerged into a lovable beetle (if there ever could be such a thing!) and a good friend to James. 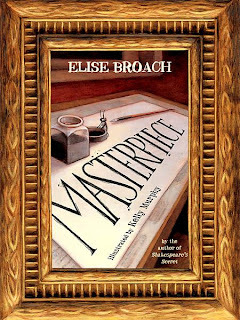 The story in Masterpiece revolves around some pen-and-ink drawings which are going to be stolen from the Metropolitan Museum of Art. "James" is called in to try to recreate an art piece that is going to be stolen. Only the whole scheme for having the original masterpiece stolen falls apart and, in the end, James and Marvin are involved in trying to catch an art thief. Broach does a fantastic job weaving in the history of various art thefts and talks about the importance, value and beauty of some of the great art masterpieces. Furthermore, she uses her imagination in introducing us to Marvin, a beetle with artistic talent in his front legs. I found the story to ultimately be charming and well-told. I'm definitely hanging on to it for future reads with my kids - with the caveat that they have to be old enough to discuss divorce before reading it so that we can discuss that aspect of the story. In all other respects - imaginative fun and I'm delighted with it! I'm definitely happy to have found it. Any books out there that have been fun surprises for you? Books you didn't expect a great deal from but then were delighted by what you found inside? What were they? I'd love to hear about your own self discoveries this happy Friday. In the meantime - enjoy your weekend! Amanda listened to this audiobook and enjoyed it (in spite of an unremarkable narrator). I LOVE it when a book surprises me. Sounds really cute! I love stories that take a unique twist on things! Oh, and have you read eye of the god? It deals with art theft and was really good in my opinion!